The clumsy canine star of Dog's Colorful Day is back in a picture-book adventure that will have children barking, braying, chirping, and hooting with laughter. From the moment he hears his first wake-up birdcall, Dog is off on a day full of interesting, irresistible noises. He makes many noisy friends-a rooster and a donkey, cows and pigs-and soon his lopsided ears are full of silly animal sounds too melodious to just listen to-Dog must imitate them as well! 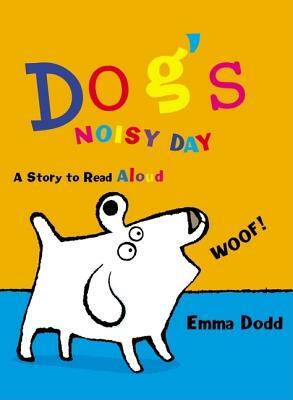 With the fresh, brilliantly colored art that gives her books such perfect preschool appeal, Emma Dodd offers another eye-catching and raucous read-aloud hit, starring the irrepressible and charming Dog.